Bourne Amenity was first enlisted to blend a soil for podium planting back in 2007. We were challenged to come up with a lightweight solution to help reduce the load burdening, while maintaining the topsoil’s structural and nutritional integrity. The usual field bulk density of our topsoils at field capacity is around 1,300kg per m³ and this had to be reduced to a working density somewhere below 1,000kg per m³. However, we didn’t see our first official specification for a podium planting medium, until 2012. Podiums differ from roof gardens, as they don’t often have the depth of materials available due to the way they are engineered. They are usually car park roofs and haven’t been designed to take volumes of materials, or don’t have set drainage systems installed ready for the landscapers to finish the work. The trend has changed over recent years and we now see a greater need for greening large house builds, specifically in cities; it’s now taken into account at the design stage, allowing for better living environments and better designed drainage systems to ensure longevity. 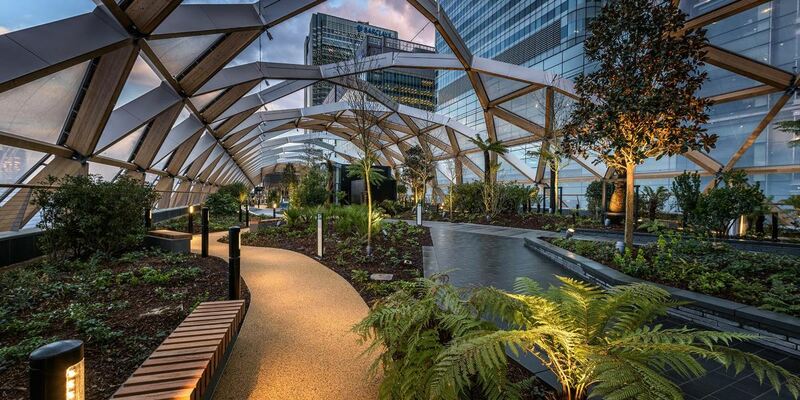 Podium soils, where load bearing and drainage are primary concerns, are becoming popular among those designing urban schemes that need to comply with SuDS requirements, as well as satisfy demands for more green spaces in densely populated areas. We have seen projects, such as Thomas Heatherwick’s 1,000 Trees scheme in Shanghai, which look to make the most of urban space with an abundance of living roofs and walls. Space is at a premium, so designers are looking for innovative ways to reproduce full planting schemes, with limited space and weight demands. To make a naturally heavy, sandy soil more lightweight, we experimented with various materials that have the desired effect without compromising the availability of nutrients or the integrity of the soil’s drainage capability. When blending soils, you must find a natural balance that suits the planting scheme and does not result in a material that has zero water retention and ends up drying out. There are various options available, from expanded clay pellets to crushed brick, and at Bourne Amenity we utilise both across our range of lightweight materials, for planting on podiums as well as roof tops. By using single size sands and materials, such as Lightweight Expanded Clay Aggregate, you can reduce the topsoil compaction that usually accompanies the installation of these materials on congested inner city projects. The sand and the Lightweight Expanded Clay Aggregate opens the soil profile and allows for water and air to pass more freely throughout the soil layer, creating a healthier environment for plants and shrubs. The blending ratio is key to maintaining the correct drainage-to-nutrient balance, and it’s crucial that soils perform across drainage and nutritional indicators, as well as bulk density. Ideally, the dry weight of your podium soil needs to be as low as possible, without compromising the structure or growing performance of the topsoil. Aim for around 800-850kg per m3 when the soil is bone dry. This will increase upon saturation, but manufacturers should aim for their material to not rise above 1,200kg per m3 when fully saturated. If the scheme is effective, then the material should never reach full saturation, but it is important to include the saturation figure in your analysis. The new Gardenscape website is live and, though it still has some teething issues, it's looking good! We would love some feedback though. Please take the website for a test-drive and let us know what you think. Have you got some more questions we could add to the FAQ section? What do you think of the photography? Are the products easy to find? And most importantly - does it make you want to go out there and start planting...? 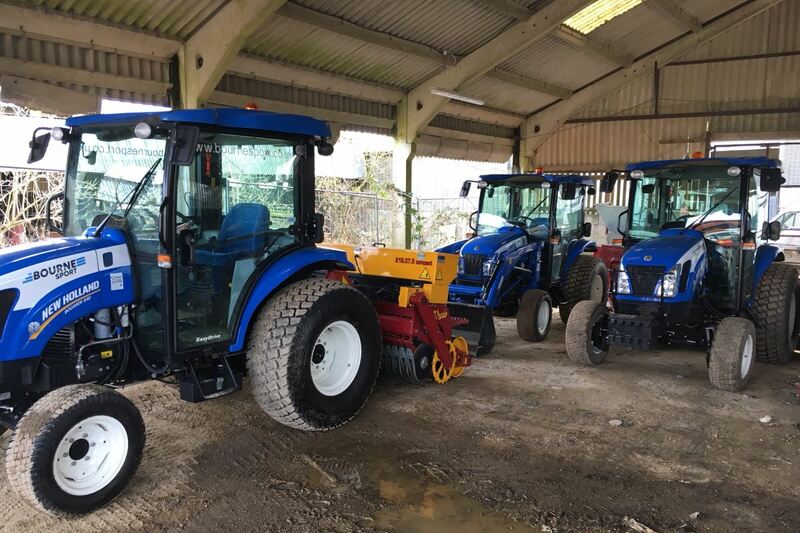 Here is part of our fleet of compact tractors for maintenance and general utility work, patiently waiting at the depot for the weather to improve and the football season to end! It's time to be thinking about pitch renewals and improvements - but the Beast from the East is still making life difficult for groundsmen round the south-east. The Agri-Expo show is held annually at the Kent County Showground, near Detling. 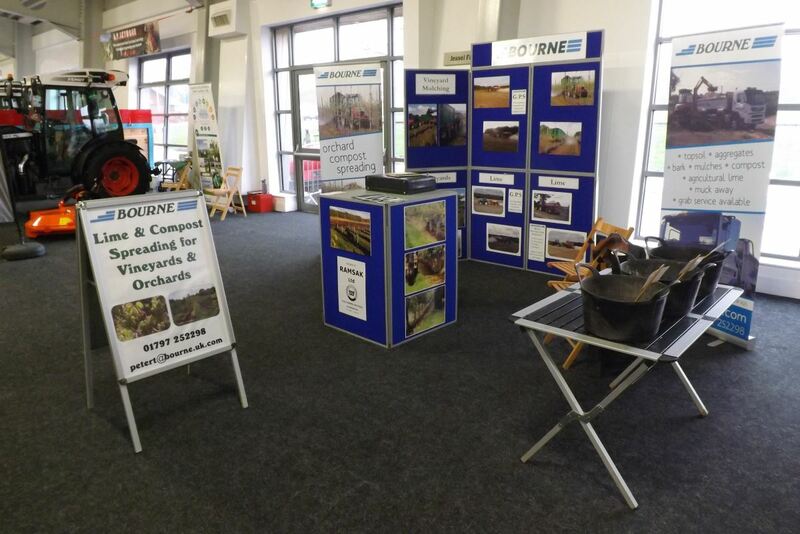 We always have a stand there, in order to keep up with the local agricultural community. Peter Traill knows everybody and it is both fun and educational to come along as an outsider. Absolutely everything related to agriculture is on show here, from combine harvesters to smartphone apps. We have a small stand in the main exhibition hall but there are also outdoor stands for bigger pieces of machinery and other robust stuff. I did not feel particularly robust on arrival as it was cold and drizzling, and a long way to walk from the parking area, with surprisingly large snowdrifts still left over from the attention given to the North Downs by the Beast from the East. But things gradually warmed up, and with the rise in temperature followed a rise in the visitor levels. It's just a one-day show so it's important that the weather co-operates - not too good, and not too bad. We definitely need to update our exhibition materials - the combination of old and new logos (as can be seen above) is not good. But since pictures of lorries are an important part of our display, we need their liveries to be updated first... this could be a lengthy process. Something for the marketing department to get a grip on, I feel! I think this is a good show and worth continuing to support, but the organisers need to rethink their approach to visitor parking. It is evident that potential parking space is being withheld in case there is a sudden influx of outdoor exhibitors but that does not seem likely to happen. The next show for the Bourne Group is the Heathfield Agricultural Show, on 26 May. That is more a Gardenscape event but the stand will have an overall Bourne flavour to it as well. The never ending stream of statistics showing increasing childhood and millennial obesity, and the rise of female sports participation will ensure a growing demand for pitch improvements at all levels. Many local football and rugby clubs are devising more and more ingenious ways of funding pitch improvements, ranging from commercial sponsorship to landfill tax credits and governmental grants. The success of our recent open day held at Sevenoaks Town FC showed that there is growing interest on the part of regional football and rugby clubs in improving the playability of their pitches. While the introduction of hybrid pitches at about 60% of the cost of a full 3G pitch is welcome, the cost of some £300k still represents a huge investment for a small club. In the rush for an artificial pitch of some form it is often forgotten that significant improvements can be made to a natural grass pitch to increase its availability at a more reachable price. This is particularly true of the clay based soils on which most local pitches are found. The installation of piped drainage, enhanced by secondary drainage and a large dose of imported sand can, at a quarter of the price of an artificial pitch of any kind, provide the increased playability sought by small clubs. As an average, while undrained clay soils can sustain only 2/3 hours play a week, a fully drained pitch can stand up to 12 hours play. There is also the added benefit of reducing the number of cancelled fixtures, leading to better attendance figures and bar, refreshment and merchandise sales. Central to this improvement, however, is the ongoing need to devote resources to maintaining the passage of water through the surface to the drainage system. There is no point installing a full drainage system unless regular efforts are made to ensure water gets off the surface and into the drains. Not doing so results in a waterlogged pitch and cancelled games. The same considerations, incidentally, also apply to the maintenance of artificial pitches – not looking after them can halve the expected lifetime of a carpet costing perhaps £150k. All natural turf pitch construction specifications will include a requirement to spread at least 100 tonnes of sand on the pitch for the first 3 years after construction. This figure must be built into the capital cost of the project, even though the charge will be incurred over 3 years. This may not be easy for the supplier of the funds, but it has to be provided for by the club in some way. If not carried out, the surface will consolidate and the benefit of the improvements will be lost in a short period of time. Similarly, regular pitch renovation work at the end of each season, including verti draining, sand spreading and overseeding will ensure that the drainage infrastructure put in at considerable cost will continue to provide the benefits. The extent of works required of course depends on the degree of damage to the surface, which in turn will be dependent on weather conditions through the season. Clubs looking to invest in an enhanced drainage scheme as a way to accommodate more players must plan not only for ensuring that the three year post construction period is funded, but also that there is a sufficient ongoing income stream to cover annual pitch renovation work.